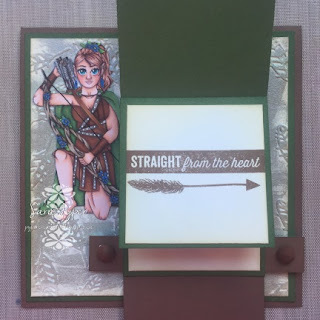 Pyper Creations: Waterfall Valentines Day card using Flowers, Feathers and Fairies "Elf Huntress"
Waterfall Valentines Day card using Flowers, Feathers and Fairies "Elf Huntress"
Hello everyone!! I have another new, super fun Flowers, Feathers and Fairies image to introduce to you all!! Meet Elf Huntress!! Isn't she amazing!! Sabrina has been working on her for a very long time and I am so excited that she is finally ready for us all to play with!!! 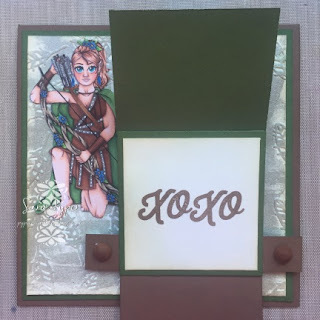 I used Elf Huntress to make my hubbies Valentines Day card. I'm sure he will be surprised its not his usual "riske" image LOL but I really think he's gonna like it!! I used the CTMH "This Moment" stamp set for all the panels in the waterfall. 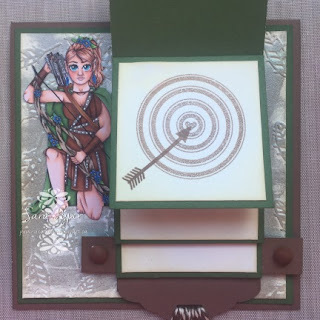 My cardstocks are also all CTMH but the pattern paper I made myself with a We R Memory Keeprs embossing folder and some homemade Emobssing powders. To create the waterfall card I used THIS tutorial and modified it just a little to be the right size and shape for my project. Please pop by the Flowers, Feathers, Fairies Facebook Group and see what the other Design Team members came up with for this weekends New Release!! We are all so excited!! And then pop into the Etsy Store to grab the new Elf Huntress digital stamp from Flowers, Feathers and Fairies!!! I am entering this card in the World Wide Open Design Team Challenge. Beautiful! Really love that you took an old technique and made it new and modern again. Great image for so many projects. WOWSER WOWSER. Fantastic. Love it. Great work. 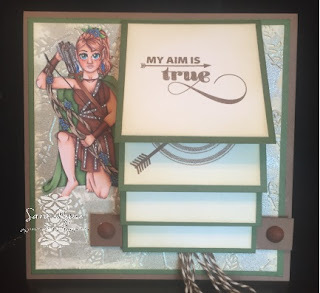 Thank you for sharing this card at World Wide Open Design Team Challenge. I love the waterfall effect.